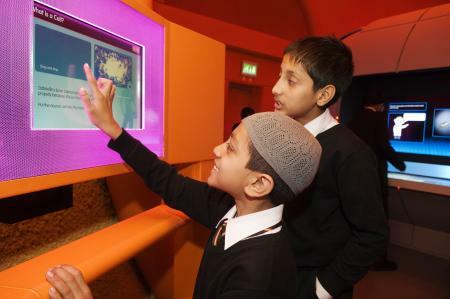 If you love London’s fabulous Science Museum but feel your family has done it inside and out, Centre of the Cell, a cutting-edge tech centre in East London, is perfect for expanding your horizons. There’s hands-on fun to bring out the budding doctors, nurses, lab technicians and pathologists in all ages! Dominique Dinse visited Centre of the Cell with sons Oliver, 12, and Ben, 11. Staffed by enthusiastic medical students, this is the first science education centre – ANYWHERE IN THE WORLD! – located within working research laboratories. Suspended above those bustling labs in the Blizard Institute in Barts and the London School of Medicine and Dentistry, you get to see research scientists at work – maybe working on an actual breakthrough as you visit! Once inside, you’ll learn about the fascinating world of cells, the amazing human body and the very latest medical research. The youngest visitors will absolutely love the Pod. After tiptoeing theatrically across a raised walkway so as not to disturb those bustling scientists working in the labs below, you file into the (happily soundproof) bright circular for a welcome chat. It’s a bit like being in a spaceship. The friendly medical students clearly know their stuff – shout out to Sofia, Krish and Thujina who rocked our session – but they cleverly gear their presentation to their young audience. “That’s not even a number!” called out one five-year-old on hearing that there are more than 70 trillion cells in our body. “Oh, yes it is! It’s more than the number of stars in our galaxy!” shot back quick-thinking Krish. You’re invited to look up at ceiling screens showing a video telling us more about our hard-working cells, before our gaze is directed to a big, egg-shaped installation in the middle of the room studded with more video screens which flicker to life with lots of hands-on games and activities. The students are quick to hop in and help if little ones are slow to get the hang of things. It’s worth noting there are helpful warnings counting down to the end of the session – from four minutes to zero – to prevent meltdowns when it’s time to come away from the screens. Early learners will love the bright, interactive Pod, with games designed to spark imagination and interest in even the youngest science fans. One game, operated by a 1p coin – supplied by the helpful hosts – shows just how small the single cell is that everyone grows from. Another has a mouse pad where you place your own palm inside handprints moulded in coloured plastic consoles to navigate around the screen, literally encouraging kids to get hands-on with the technology. Some of the interactive themed shows are specifically designed for little learners – check the age group when you’re deciding what to book ahead of your visit. At the time of our visit the centre was offering A Mummy for Melissa, the story of a newborn monster which cleverly teaches about the wonderful world of cells. There won’t be a Year 3-6 kid who won’t love Poo Racer, an action-packed screen-based game in the Pod that takes you on the roller-coaster journey your food takes through your gut to its natural end – in the toilet bowl. This game is one of the many free ones available on the website; my two boys haven’t stopped playing since our visit. 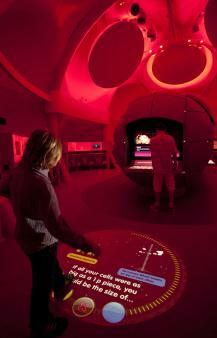 Older children will also be drawn in by the props and exhibits dotted around The Pod. These include an actual hands-on microscope, into which you can peer to discover all sorts of cells; sections of brain, liver and other organs giving a fascinating peek inside the human body. All cleverly age-appropriate, these will draw out the natural curiosity inside young budding scientists. The interactive themed shows hosted by the medical students after your Pod visit are a don’t-miss. Far from dry lectures, these are fun and fact-packed, noisy and occasionally deliciously messy sessions that kids love. There’s a huge range of themes to choose from – including the invitingly titled Snot, Sick and Scabs, about the microscopic world of bacteria and viruses; Spores, Sores and Sickly Bugs, where visitors uncover 100 years of miraculous medical history in London’s East End; and Muscling In, which explores the wonders of your magnificent muscles and brilliant bones. All are specifically targeted at various years within the seven-17 age group, so just choose one suited to the age of your children (each is clearly spelled out on the brilliant website). Because the centre is staffed by students, it’s only open in the school holidays – although groups can book during term time. But with such a choice of shows, which change every holiday, you could come every day and not get bored. On offer in the 2017 summer holidays is Gut Feeling, aimed at ages seven-14 and telling the story of one boy’s breakfast as it gets chomped and chewed, digested and absorbed by his body – to be eventually greeted by the toilet bowl. Or War on the Wards, exploring medical gore and more from the First World War and investigating its influence on modern medicine. 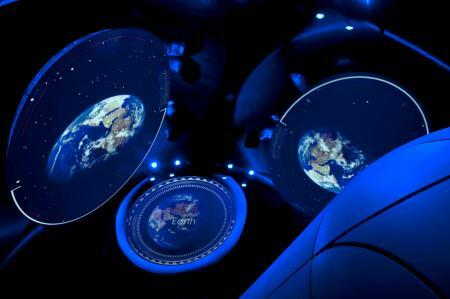 All these shows are preceded by a session inside the cell-shaped Pod, suspended over the laboratories of the Blizard Institute. The Nucleus Café on the ground floor – all bright red and orange walls and surfaces with floor-to-ceiling windows looking out on to the sunny courtyard – is open from 8.15am to 3.15pm and geared to the students and staff working here, with visitors warmly welcomed. On offer are freshly made grab-and-go snacks: paninis, baguettes and sandwiches from £2.50 to £3.25; fresh fruit salad for £2, bottled juice for £2 and £1.50 brownies and flapjacks. Hot dishes include soup with bread for £1.65 – spicy mixed bean on the day we visited; £3.10 pasta of the day and jacket potatoes from £1.20 to £3.15. There are easily accessible toilets with plenty of space for baby changing, and the café will happily warm up bottles or baby food. Another lovely thing is that the café is owned and run by Queen Mary University of London, so any money you spend here goes back into the university – and may take care of your little one if they decide to study here when they’re not so little any more! Parking is limited to a small number of metered parking spaces for cars, so the best way to get here is by London Underground – it’s about five minutes’ walk from Whitechapel station. The station is also close to Shadwell DLR station. Adults: £7; children: £5; concessions (students, over 60s, QMUL staff, disabled visitors): £5; under-3s: free. School sessions costs £150 and can accommodate up to 40 visitors (including accompanying adults) – 30 visitors for an optimal experience. Centre of the Cell is open Monday to Friday. During term time sessions are reserved for school groups. In school holidays sessions are offered for the public to book. Unlike most museums, you don’t exit through the gift shop – sparing the inevitable meltdown if you need to make a quick getaway. But this small and beautifully curated shop, up the stairs from the entrance/exit, is well worth a visit. You’ll find everything from branded pencils and rubbers (50p each) to £7 science kits. Everything’s well priced – the most expensive item is a pack of three Top Trumps cards (£10 – or £4.50 each for either Bacteria, Cell or Virus packs, all made specially for the centre and packed with super-sciency info). My boys made straight for the packs of satisfyingly squidgy putty (£1.50 each in a rainbow of colours) and also purchased freaky-looking soft toy microbes (£4.50 for mini versions, £5 for the large ones). 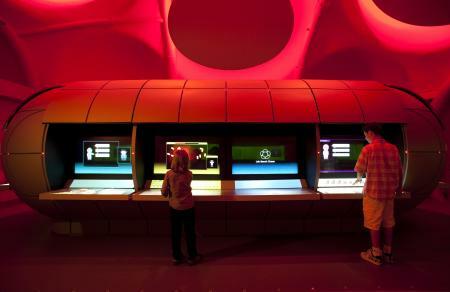 The brilliant thing about the Centre of the Cell is that it was set up as an online resource and outreach project as well as a visitors’ centre. 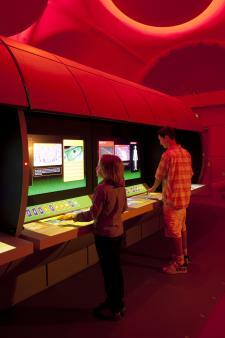 The website is packed with games and apps that kids will love, even if they never make it to the London centre. Download Gene Quest, the game where you take on the role of a scientist and explore East London to find people with genes that hold the clue to curing illness. And Poo Racer, where you rev, race and roar your very own poo through the gut track – will your driving skills get your poo to the toilet on time? All these fabulous apps are free from the brilliant website. Learning about life and living things and the human body is part of science lessons in primary school.